The Franz Xavier Winterhalter (1805-1875) portrait of Princess Elena Pavlovna Kotschoubey (née Bibikova) from 1860 is a wonderful testament to the artist’s talents and portrays Pr. 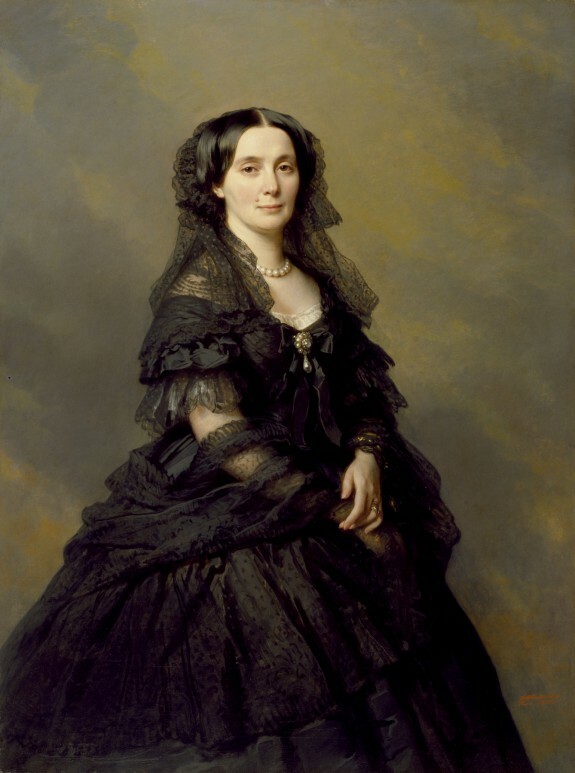 Elena Pavlovna still in black, mourning for her decesad second husband Prince Vassili Victorovitch (1818-1850). It is located at the Walters Art Museum in Baltimore, MD, USA and an 1964 gift to the museum from the heir, Prince Sergei Belosselsky-Belozersky of her first husband, Prince Esper A. Belosselsky-Belozersky. According to the Walters Art Gallery the provenance was: Princess Kotschoubey [1812-88] and/or her family, St. Petersburg, 1860, by commission; Prince Konstantin Esperovitch Belosselsky-Belozersky [1843-1920], St. Petersburg, 1888, by inheritance; Prince Sergei Konstantinovitch Belosselsky-Belozersky [1867-1951], 1920, by inheritance; Prince Sergei Sergeievitch Belosselsky-Belozersky [1985-1978], 1951, by inheritance; Walters Art Museum, January 1964, by gift. Description of the Painting: Although born a peasant in the Black Forest region of southwestern Germany, Winterhalter became the foremost portraitist of European royalty and nobility. Hélène Bibikoff was initially married to Prince Esper A. Belosselsky-Belozersky and subsequently to Prince Kotschoubey, the son of the chancellor of the Russian empire. A woman of great wealth, even by the standards of her time, the Princess travelled extensively, mingling in the European courts, and entertaining lavishly. Her palace on the Nevsky Prospekt, St. Petersburg, was the setting for balls that rivaled those of the court in all its grandeur. She is reported to have maintained her role as a social leader at the imperial court with autocratic zeal. Winterhalter has depicted her in one of his customary formats, three-quarter length, nearly life-size, and painted against an overcast sky. She wears a black silk gown, black lace, and jewelry, including a necklace of large pearls, a pearl brooch with a large pendant pearl, a flexible, serpentine bracelet, and several rings.